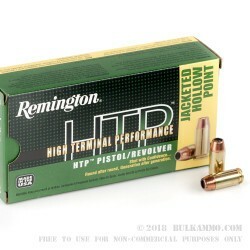 This 40 S&W cartridge from Remington’s High Terminal Performance (HTP) line of ammunition is meant to combine premium primers, quality brass casings, fast igniting propellant, and other quality components that you can depend on in a life or death situation. This is as guaranteed as a round can be to provide day-saving stopping power, assuringly backed by Remington’s exemplary reputation for excellence. This round sports a 180 grain jacketed hollow point projectile. Its jacket serves to ensure that the round feeds reliably in a semi-automatic pistol, and also controls the massive expansion provided by the bullet’s hollow point. Working in conjunction with this round’s fast 1,015 fps muzzle velocity, this cartridge lives up to the claim that it will really deliver when used for personal protection. 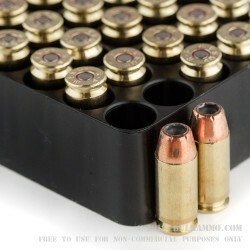 Ideally, personal protection ammunition will sit around for awhile -- forever, hopefully -- before it is fired. This round’s non-corrosive Boxer primer will ensure that it’s ready to go for a very long time.